Night riding can be eerie, there’s no question about that. Casting shadows as I pedal through the forest plays tricks on the eyes. Seeing movement where there is none, as my light dances across the trees, causes a surge of adrenaline. Nothing like a little scare to get the heart pounding, to make me feel alive and keep me pedaling. And the eyes, all the eyes. Even though it’s quiet, the forest is alive at night. The quiet is what gets me. To stop, turn off the lights and listen brings peace to my soul. With the absence of light and visual stimuli, the auditory senses are on full alert. It’s like I can hear the trees whispering to each other, as if they know I’m here. Slowly my eyes adjust to the darkness, and the moon and starlight shine down. If I’m lucky it’s a full moon and a clear sky. It’s breathtaking. But now it’s time to ride, and the light that guides my way shines bright. I only have to glance to find direction. Everything in the periphery is dark, so I only look at where I need to go. It’s the best advice, to only worry about where you’re headed. Nothing in the dark matters at this moment in my life. Unless it’s another set of eyes. Maybe then it’s worth a glance, but I might as well keep ripping down the trail. The rocks, the roots, the dirt; everything on the trail looks slightly different at night. The shadows aren’t the same. They’re just a bit off axis. I guess that’s to be expected. It’s as if the sunlight is coming from my head, making me the center of my own little world out there in the dark, quiet forest trail. 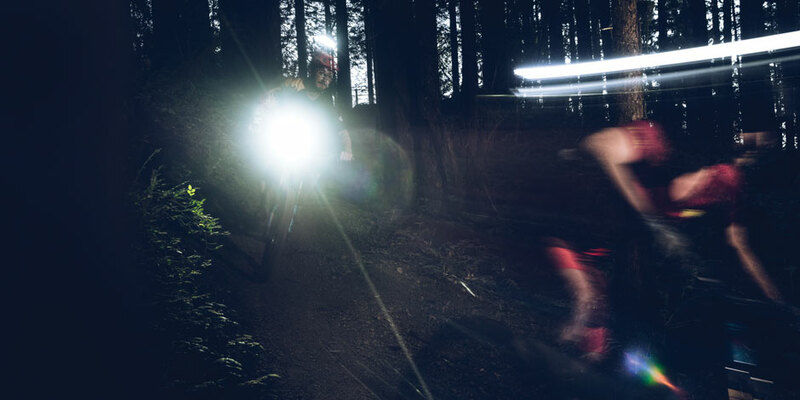 Even in a group, the solitude of night riding is a special feeling. I catch glimpses of light bobbing ahead or behind as the trail winds through the forest. I know others are there, but I can’t see them, just their floating lights flickering through the trees. The magic of being in the forest after dark draws me back. As the nights grow longer I get excited to dust off my lights and charge them for a new adventure. I love the night ride. Shine on, baby.